Subjective tinnitus has many forms and may be regarded as a group of disorders rather than a single disorder. There are a few objective ways to distinguish between the different forms of tinnitus. Intensity: Often using a visual analog scale or loudness matching. Character: High frequency (like crickets), low frequency (rumbling), tonal, pulsatile, constant, or intermittent. Other features such as the ability to modulate the tinnitus by manipulating their jaw, moving their eyes, or applying pressure on neck regions. Whether referred to one ear, both ears, or perceived as being inside the head. Some diseases, such as Ménière’s disease, are accompanied with tinnitus; such tinnitus may be different from other forms of tinnitus. Some forms of tinnitus are associated with affective disorders such as depression or phonophobia. 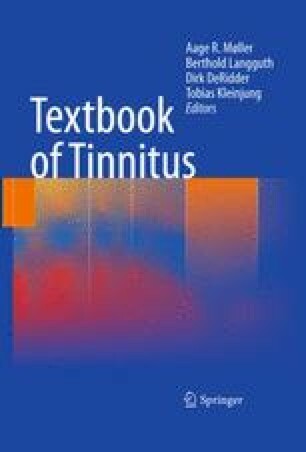 Subjective tinnitus is often accompanied by abnormal perception of sounds, known as hyperacusis (lowered tolerance for sounds) or hypersensitivity to sounds.